Legend has it that Roman Emperor, Claudius II, way back in the third century, forbade young men from marrying, preferring instead that they become soldiers in his army. This infuriated a young priest by the name of Valentine who defied Claudius II by carrying on his practice of marrying young couples in secret. Valentine’s clandestine actions were eventually found out and Claudius II sentenced the young romantic priest to death for his crimes (not the same fate for those failing to buy flowers on Valentine’s Day for the one they love, but certainly a cautionary lesson from history!). While in jail, waiting for his sentence to be carried out, Valentine fell madly in love with the jailer’s beautiful daughter who often came to visit him. Prior to his execution, Valentine wrote a letter to his love, signing it “From Your Valentine”, the same expression we use today. On February 14, 270 AD, Valentine met his fate and was executed. Valentine went on to attain sainthood and Pope Gelasius, in 496 AD, designated February 14th as Valentine’s Day, a day to honour and celebrate the sentiments of Saint Valentine. We are still honouring Saint Valentine today and remember his romantic story every year on February 14th. We celebrate the love we feel for those close to us, especially our significant others and family. For centuries fertility festivals have been celebrated in mid-February in many parts of the world. It’s no wonder then that flowers are the gift of choice for Valentine’s Day. Flowers have always symbolized love, romance, marriage and fertility The custom of giving your loved ones flowers on Valentine’s Day comes from the ancient tradition of sending bouquets of flowers to convey a non-verbal message. In the 18th century, Charles II of Sweden introduced the practice. He attached a special meaning to each different flower, which made it possible to conduct an entire conversation with flowers alone. This custom continues on today with people all over the world sending flowers on every special occasion and of course when they want to express their feelings of love and romance. Flowers are not the only gifts being bestowed on Valentine’s Day. People customarily send boxes of chocolates, hearts in all their forms, and cards. An estimate by the Greeting Card Association is that a billion Valentine’s cards are sent every year throughout the world, second behind the Christmas holiday for sending cards. 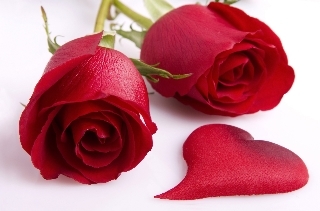 The traditional flower for expressing romantic love is the rose. However, there are lots of other flowers that are sent on Valentine’s Day to convey different types of love as we all have many people in our lives we love. This Valentine’s Day, the florists at FloristNZ have designed some beautiful bouquets that convey every kind of love and that are very reasonably priced. We, of course, have an entire range of choices for Valentine’s Day expressing all the varying degrees of affection. These are a Valentine’s Day tradition, an expression of romantic love. We offer one, two, three dozen or more short-stemmed or long-stemmed roses. We recommend red roses for the one you love. We can deliver them in boxes, baskets or vases. Your love is so strong that one day of celebration is just not enough. Surprise your true love by having us deliver flowers on Valentine’s Day, and again on the following two days after. Let them know that the fire still burns in your heart. Valentine’s Day is the perfect time to remind your mother and/or grandmother how much you love them. Don’t let this day go by without sending her flowers, whether she’s nearby or far away.